Baseball and Softball are on the shortlist of sports that are still being considered by the International Olympic Committee (IOC) for inclusion in the programme of the 2020 Olympics. The other two are wrestling and squash. 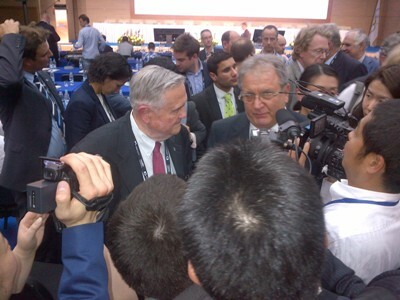 It was annopunced in Saint Petersburg (Russia) at the end of the fourth day of the SportAccord Convention. IOC Director of Communications Mark Adams made it to the press briefing room at 7.28 pm local time. After a brief introduction, he announced the three bids that had been accepted in this order: wrestling, baseball/softball and squash. The work of the World Baseball Softball Confederation (WBSC), in which the IBAF and the International Softball Federation (ISF) had merged earlier this year, has been thus rewarded. Co-Presidents Riccardo Fraccari and Don Porter had a first, unanimous thought for "The millions of baseball and softball players in the world". Fraccari added: "I wish to thank all of the professional organizations. They really supported us". Porter used the game's language to express his feelings: "We are in the 7th inning now". IOC Director of Sports Christophe Dubi made it clear that the merging of the two bodies into a Confederation was one of the keys for the inclusion of baseball and softball in the shortlist. Programme Commission Chairman Franco Carraro, who was explicit in saying that he was going to answer only to technical questions and wouldn't accept to comment "political" issues, explained that the decision required 9 rounds of votings. Asked why the shortlist is made of 3 sports, Carraro answered: "After an global evaluation, that was the decision of the Executive". Carraro also suggested that: "We are not talking about a game with two halves. The Buenos Aires voting is going to be a totally new match." Riccardo Fraccari made a similar reflection: "We all start over at zero. It's going to be challenging. Our competitors are great sports". The IOC distributed a press release with a declaration by President Jacques Rogge: "The Executive Board received excellent presentations today from 8 International Federations. It was never going to be an easy decision, but I feel my collegues on the Board made a good decision un selecting baseball/softball, squash and wrestling to be put forward in Buenos Aires. I wish the 3 shortlisted sports the best of luck in the run up to the vote in September. During the press conference Franco Carraro had previously explained that: "First the Congress will approve the core list of 25 sports. As you may recall, rugby 7 and golf will be in the 2020 Olympics anyway. So, the voting will be to pick the 28th sport".